A new pavilion in Amsterdam’s financial district is leading the way in completely circular buildings—structures that are not physically round, but that practice the principles of the circular economy. Circl Pavilion is home to banking institution, ABN AMRO, whose project team not only rejected initial designs presented by contracted architects and builders, but who also hit pause during the project delivery because the design was not sustainable enough. This insistence on only the highest green standards led the design team to shift gears, and investigate how the pavilion could be made as circular as possible. “They broke their heads over the question of how they could take the existing plans for the pavilion—now already under construction—and remould them into a circular form,” Circl’s management said. The end result is a building with materials and products that have value at the end of their life, so that in effect, raw materials—a finite resource—can go on to be used infinitely. This circularity in design extended into the interiors. The interior is designed based on a minimalist material palette, and to minimal material loss and technical handlings. Instead, the team focused on the intrinsic qualities of homogenous materials, with only dry connections to ensure disassembly and future reuse. A key feature of the interior design is walls that are able to adapt to various spatial needs and changing programs—from day-care in the morning, to dance events in the evening. Through intelligent lifting and sliding technology, these shifting walls reconfigure spaces quickly and safely at just the push of a button. “Comfort is offered by making the room bigger or smaller, and efficiency is met through functional and flexible design,” DoepelStrijkers explained. The movable panelled walls are made of recycled aluminium and expanded metal mesh, while its acoustic buffers were made from recycled denim jeans. Existing objects were given renewed purpose, such as the bank’s old safe deposit boxes being reused as kitchen storage. 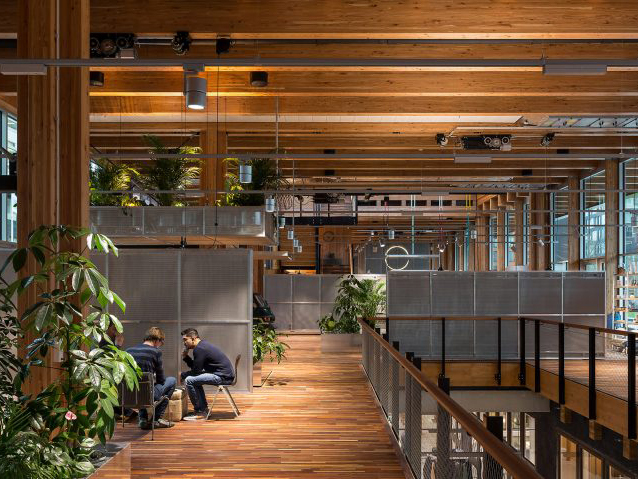 "The challenge for us as an office lies in translating our sustainable ambition into objects and spaces that transcend the traditional image of sustainable design. We search for a spatial translation of sustainability criteria into an image that does not directly refer to reuse for example, but rather by incorporating the positive attributes of sustainable building principles into objects, spaces and buildings that reflect our contemporary design idiom,” DoepelStrijkers noted. Photography by Peter Tijhuis, courtesy of DoepelStrijkers.